God is my portion, and my cup: Faith -- Rejoice In Him! God Subdues The Nations Before Us. Faith -- Rejoice In Him! God Subdues The Nations Before Us. Joshua and his people finally had overcome the painful defeat of Ai. Joshua asked to God why. God instructed him, and Joshua precisely followed the God’s instruction. Initially, it was a huge mistake for Joshua not to ask God first. He also did not know Achan’s terrible sin because it was a hidden sin. Joshua should have come to God and asked Him. However, the painful defeat made Joshua returned to God. God told the sin hidden among his people. Joshua immediately searched for the sin, and completely eliminated the root of the sin and purified the entire Israelites. Why? The sin blocked the blessings from God. Then he humbled himself and asked to God for His guidance. A mere appearance often deceives us. Ai was one excellent example. Ai looked small especially compared with Jericho. Joshua and his people felt it was a piece of cake to take over the city of Ai. To make sure, Joshua sent spies to Ai. As expected, the spies returned and reported, “There’s no need for all of us to go up there; it won’t take more than two or three thousand men to attack Ai. Since there are so few of them, don’t make all our people struggle to go up there.” This report and suggestion exactly matched with what Joshua was about to do. This made Joshua more confident for a victory over Ai. Without a slightest doubt, Joshua sent 3,000 warriors to conquer Ai. As we all know, they experienced a humiliating defeat, and this was how Joshua failed, such a faithful one before God. It was also the greatest of Joshua that Joshua did not run away from the humiliating defeat. Instead, he humbled himself and returned to God. Once he heard God, he was infinitely faithfully and exactly followed what God instructed to him, such as how to ambush against, to trap and to defeat Ai. Through the absolute obedience, Joshua and his people finally were able to capture Ai in God’s wisdom, guidance and protection. After the victory granted by God, Joshua immediately returned to God, and built an altar to the LORD, the God of Israel, on Mount Ebal. 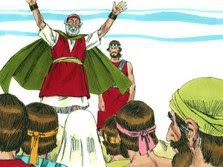 He followed the commands that Moses the LORD’s servant had written in the Book of Instruction: “Make me an altar from stones that are uncut and have not been shaped with iron tools.” Joshua learned the lesson the hard way. Joshua realigned himself with God, and precisely followed God’s instruction given through Moses, the former leader before him. Yes, the alter was built with stones not sharped by human’s hands. The purity was maintained, and the uncut stones were dedicated before God to build the alter for God. Then on the altar Joshua and his people presented burnt offerings and peace offerings to the LORD. 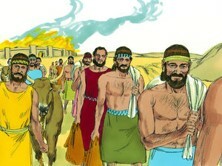 The built offering completely destroyed as the renewal of the relationship between God and the sinful Israelites. The peace offering was given to please God, which was their thanksgiving from the deepest part of their heart. And there, in the presence of the people of Israel, he wrote on the stones a copy of the law of Moses, which he had written. It reflected Joshua’s highest gratitude to God, and his attempt to make the law of Moses, i.e., God’s Word permanently engraved in the hearts of the people of Israel. 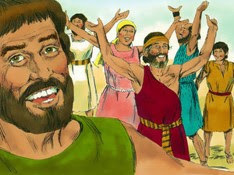 Here is what Moses did when the people of Israel were about to close the Jordan river and entered in the Promised Land. 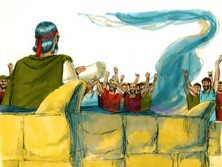 Moses gathered the Israelites and gave this charge to the people: “Obey all these commands that I am giving you today. When you cross the Jordan River and enter the land the LORD your God is giving you, set up some large stones and coat them with plaster. Write this whole body of instruction on them when you cross the river to enter the land the LORD your God is giving you—a land flowing with milk and honey, just as the LORD, the God of your ancestors, promised you. When you cross the Jordan, set up these stones at Mount Ebal and coat them with plaster, as I am commanding you today. Joshua did exactly what Moses commanded. He divided his people in two groups, and made them facing each other. One group proclaimed the blessings of God, while the other group the curses from God to truly make all Israelites know and remember God’s blessings for obedience and curses from sinning. Please imagine millions of the Israelites gathered and faced each other as two big groups on the two mountains: Mount Gerizim and Mount Ebal, which faced each other. (The distance of the two mountains is about 1 mile or 1.6 km.) Then in one voice, one group recited God’s blessings, while the other group God’s curses. Why did God command this ritual? God wanted for them to have a truly memorable moment in their lives so that they would not to forget the Law of God forever. After experiencing the majestic scene and the solemnness of the presence of God with the Ark of the LORD’s Covenant, who would forget God’s majesty, His solemnness and His commands as blessings and curses. Yes, not just blessings, but curses too. God dearly loved the people of Israel. He stretched His Hand and subdued Jericho by tumbling down the mighty wall. God pleased with His people who were truly faithful to His Word, and the Israelites were in joy and victory. Soon after they had gone following their own heart and sinned. The sin was hidden, but God patiently waited for their return. They were beaten and in pain out of their sins, but God was there with them. God did not let the Israelites alone. God watched over every step of the Israelites simply because they were His beloved children. God thought out for them, and when they return to God. God embraced them again, and comforted them with His love. Then He poured out His wisdom on them. By following His wisdom, the Israelites, His children, prevailed again. They captured Ai. The victory was, then, contributed to God. Joshua and his people bult the alter with uncut stones, and wrote down the Law of Moses to remember forever. Most of all, they experienced God’s majesty, power and glory when shouting in one voice with facing each other in two groups on the two opposing mountains. The Ark of the Covenant was at the center. All Israelites heard the sing and praises of their fellow Israelites, “Sing praises, and praise to God. The One who never stops loving His children. Although we committed a hidden sin and reveled against Him, he was there. When we were defeated by our enemies, His hand was with us to lift us up again. He was faithful, and he is also as this moment. Yes, He is always faithful to His children, because He is our Ever-Loving Father!” Can we hear the song and praises of the Israelites? Today, our God wants for us to sing praise to Him through our victory from impossibility in Him, through Him and for Him, whether we are in the greatest humiliation, pain and failure. Let hear His voice sometimes strong and loud, some occasions subtle and quite. Let’s be sensitive to His voice, and then come to Him. Why? Our God dearly loves us at this very moment simply because we are His beloved Children.